The brand new light allows photographers and videographers to focus its powerful beam for fantastic precision, strong contrast and dramatic shadows. A simple twist focuses the PopSpot’s output from a 55° to 25° beam angle, and removable barn doors offer further control of the shape and direction of the light. We’ve even included a slot for a slide-in tungsten filter. It is available now on FotodioxPro.com in three configurations: the PopSpot Focusable Fresnel, the PopSpot Focusable Fresnel + Battery Module, and the PopSpot Focusable Fresnel 3-Light Kit with Rolling Carrying Case. Fotodiox Pro, creator and distributor of several lines of specialty solutions for videography, cinematography and photography, has announced the PopSpot Focusable Fresnel – a mighty Fresnel LED light in a tiny package. Roughly the size of a soda can, the PopSpot allows photographers and videographers to focus its powerful beam for fantastic precision, strong contrast and dramatic shadows. It is available now on FotodioxPro.com in three configurations: the PopSpot Focusable Fresnel, the PopSpot Focusable Fresnel + Battery Module, and the PopSpot Focusable Fresnel 3-Light Kit with Rolling Carrying Case. Not only is the PopSpot an ideal light for tabletop shooting or as a rim or hair light, it can be used as a primary light in many shooting scenarios. Its compact size and lightweight build offers flexibility in mounting, positioning, and concealing, and allows it to travel virtually anywhere. The PopSpot runs off either conventional AC power or an optional battery module for on-the-go lighting, and remains cool throughout use. 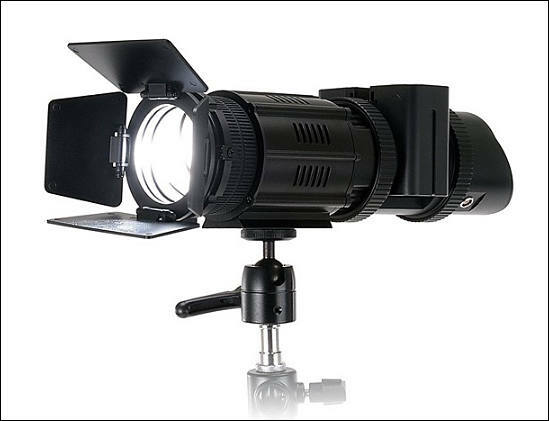 To learn more about the PopSpot Focusable Fresnel and other photography and videography accessories from Fotodiox Pro, please visit FotodioxPro.com. Bowens on front, stronger mount and take my money. The stated lux seems quite low though. At 1m spot is only around 4,500 lux? That is less that aputure 672s LED panel. The boltzen says around 4,500 lux as well but they didn't state what that means... If it is open face or using fresnel. But I have a suspicion it is open face (could be wrong). If it is open face it can be like 5-10x as bright when spotted down. I like that they thought about battery design but the spotting only goes to 25 degrees and the output seems kind of low. Plus no mention of how loud the fans are. If they do produce as much light as the boltzens and have near silent fans then they could be more interesting to me.